What is the long-term plan for the Yeshe Rangsal retreat land? 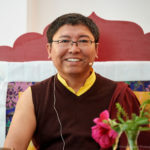 Pundarika Foundation, under Tsoknyi Rinpoche’s guidance, established a six-fold land development plan in 2004. The stupa (Jangchub Chorten or Stupa of Enlightenment), shrine to the land protectress, Dorje Yudronma, a residence for Rinpoche (Pundarika Zimchung), a Retreat Support Building and a seasonal teaching tent are already in place. The three retreat cabins and the Lama House now complete this plan. Who can use Lama House or a cabin for retreats? Have maintained a daily meditation practice for at least one continuous year prior to the retreat for which you are applying. What are Lama House and the Dharmakaya cabin like? In 2017 Tsoknyi Rinpoche blessed this house, which is on the same cul-de-sac as the Pundarika Zimchung where he lives when in Crestone, and gave it the name Lama House. It is within close walking distance to the Yeshe Rangsal retreat land, stupa and the Dorje Yudronma shrine. Lama House has two bedrooms (each with an altar), a large kitchen, living room with fireplace, laundry closet, one full bathroom and one half-bath. The house is solar-heated. The views of the mountains and valley are more limited than at the cabins. You can drive and park close to the house, unlike the cabins, and there are no stairs to contend with except for flagstone steps from the driveway to the door. There is a deck and plenty of land to find a comfortable spot outside for those who like to practice with a view of the mountains and San Luis Valley. Lama House is available for two retreatants who wish to do retreat together (e.g., a couple) or a single person who wishes to do retreat in the house by themselves. Our first retreat cabin, the Dharmakaya Cabin, was named and blessed by Rinpoche in 2017 and the second two cabins (still to be named) are also now ready for use. The retreat cabins are located on the Yeshe Rangsal retreat land along a ridge that has expansive views of the San Luis Valley, Mount Blanca and the Sangre de Cristo Mountains. Each cabin is approximately 400 square feet and has a small kitchen, deck, sitting area, altar, bathroom with shower, a fireplace and electric heat. The Retreat Support Building is a short walk from the cabins and has a washer and dryer, large shower and an additional refrigerator for food storage. How does one choose between the Lama House and the individual retreat cabins? The Lama House has easy access, is more comfortable and spacious inside with a large kitchen and bathtub. Because there is only one full bath, the shower/tub is shared. The cabins are much smaller (about 400 square feet), for one person, and more simple. They are more isolated from other houses, near the Yudronma Shrine and Stupa, and offers a large sky gazing window. Staying in one of the cabins can involve walking on sandy and hilly terrain so this could be quite challenging if you have certain kinds of disabilities. When are the Lama House and the Dharmakaya Cabin available? Retreats can be for a minimum of one week and a maximum of eight weeks. Retreats begin on a Sunday and end on a Sunday for the one-week or longer retreat times. During the annual August teachings in Crestone, neither Lama House nor the cabins will be available. They will be used for the Retreat and Land Managers during that time. Applications will be accepted for personal retreats scheduled up to one year in advance. The application process is in place now. Click here to see a calendar of Personal Retreat Space Availability. 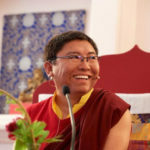 To check on retreat dates, see https://tsoknyirinpoche.org/programs/. Full payment due one month prior to the start date of the retreat. Please note: Cleaning fees stated above are part of the cost for retreat and are non-refundable. In addition, we are asking a refundable damage deposit of $100 in the form of a check made out to Pundarika Foundation, due upon arrival. This check will be returned to you at the end of your retreat if there is no damage. Also, because of unforeseen events, Pundarika reserves the right to cancel reservations, in which case a full refund will, of course, be given. Please click here to access the online application materials. In the Application, you will be asked to affirm that you have read the FAQs (this page) and that you have read and agree to the terms and conditions of the “Retreat Agreement” and “Waiver and Release” documents (also linked to the Application). Click here to see a calendar of Retreat Space Availability. If you have questions, please send an email to registrar@pundarika.org. Once the application is received, you will be notified that we have received the application by email. Two students appointed by Rinpoche will review the application. Once reviewed, we will send you an e-mail as to whether or not the application is approved so you can plan accordingly. If approved, we will include a payment link for the deposit and fees with a code of conduct and liability waiver for your signature. How do I prepare for a retreat? It can be helpful to create a preparation checklist for yourself in advance, including time for the transition going into retreat and out. Because you will be in a remote and somewhat isolated area, it is important to have everything you need before beginning the retreat. Let those close to you know you will be out of touch and how to contact you in an emergency. It is important for you to have an operating cell phone while in retreat in case of emergencies or to contact our staff. There is no landline on the retreat land. Please confirm with your cell phone server before you arrive that your cell phone will have coverage in Crestone. If your cell phone won’t have service here, we recommend that you purchase a trac phone from a convenience store for your stay. Emergency messages can be delivered for you through Wayne Hallstrom at 719-221-9871. Wayne will also be available by cell phone throughout your retreat if problems arise. What if I have an emergency or a non-emergency need for medical care? This link provides a list of hospitals and medical providers. Any advice for living in this environment? Due to Crestone’s high altitude at 8100 feet it is very important to maintain adequate hydration. There are deer, coyotes, elk, foxes, bears, mice, mountain lions and other animals living around Crestone, so please do not leave food outside the cabins, Lama House or in your car. Here is some advice on being with bears: https://www.nps.gov/subjects/bears/safety.htm and with mountain lions: www.mountainlion.org/portalprotectencounters.asp. Finally, please be aware that there is a high risk for fires in Colorado. To be safe, please do not have outdoor fires, including smoking and use of candles and incense. Familiarize yourself with evacuation routes from your place of lodging. Evacuation procedures can be found in each cabin and in Lama House. Is there a best time to come in terms of weather and other conditions? Crestone has four distinct seasons, all beautiful in different ways. In fall and spring you can experience many seasons in one day — sunny skies, intense rain, and hail or snow. Spring tends to be more windy, sometimes fiercely so. From mid-June through early August there is usually a heavy concentration of mosquitoes, making sitting and walking outside decidedly uncomfortable. Check-in time is 3:00 p.m. on the Sunday when you arrive and check-out is 11:00 a.m. on the Sunday you leave. Check-in: Our onsite Retreat Caretaker, Wayne, will greet you at either Lama House or at the Yeshe Rangsal Retreat Land upon your arrival for orientation. See below for directions. Please contact our Registrar, Susan, at: registrar@pundarika.org to coordinate your arrival time. In the case of severe weather or late arrival, you may be required to delay your check-in. You can track the local weather at: http://www.keno.org/vws/ and Colorado road conditions at http://www.cotrip.org/map.htm#/roadConditions. Check-out: Wayne will be meeting you for a short debrief on your last day and will return your damage deposit check if the cabin is left with no damages. We ask that you strip the bed and place dirty linens and towels inside the door of your cabin to help facilitate cleaning. A twin bed with comforter, sheets and pillows, a large zafu (8” buckwheat fill) and zabuton, chair, altar, camp lantern, kitchenware, pots and pans, fireplace and firewood, double hotplate, toaster oven, small refrigerator, blender, first aid kit, cleaning supplies, soaps (laundry, hand, shower and dish), water, ax, matches and basic condiments. You’ll need to purchase paper products such as toilet paper, etc., when you buy your food. The altar in the retreat cabins and Lama House will have a Buddha statue, Pundarika chant book, offering bowls, a picture of Rinpoche, the lineage tree and Dorje Yudronma. Please do not bring pets. Also, there is no visiting by friends or relatives during the retreat. What things will I need to do to keep up the cabins or lama house? Karma yoga is a daily aspect of every retreatant’s schedule. Keeping the cabin, common spaces or the Lama House clean is an essential part of doing your retreat. Cleaning products will be provided for you to keep your retreat space clean during your stay. Laundry can be done at the Retreat Support Building. Lama House has its own washing machine and dryer. Who can I get help from with general house or cabin maintenance issues or emergencies? Please call Wayne Hallstrom at: 719-221-9871 or contact him by e-mail at dakini218@gmail.com. Who can I contact for retreat and practice advice? Please call Brady Hogan at: 304-639-9889. 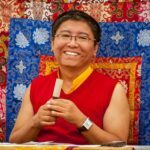 How can I see and hear teachings by Rinpoche? There will be a hard-drive in each room of Lama House and cabins with the Advanced Membership teachings on them. The hard drive is configured to work on a Macintosh computer to get full audio and video. PCs will only be able to hear audio. How do I get food and other supplies? We have two grocery stores in Crestone, one of which is a health food store. If your retreat is lengthy, you can contact Wayne Hallstrom at 719-221-9871 to purchase and deliver food and other supplies that you may need. What do I do with garbage & recycle? If staying in the cabins, please store garbage and recycle in separate bags in the Men’s Bathroom in the Retreat Support House. The Retreat Caretaker will show you where the key is. If staying in Lama House, please put garbage and recycle in the storage shed (keys to the shed will be in the house). How do I get to the Retreat Cabins and Lama House? For directions to Crestone, see: https://tsoknyirinpoche.org/retreats/getting-to-and-from-crestone-co/ and click here for a detail of the locations of the Retreat Cabins and the Lama House locations. Find your way to Moffat on Route 17. From Moffat, drive south and turn left onto County Road “T” toward Crestone (if coming from the south, turn right just before Moffat). Drive about 14 miles toward Crestone and on your right will be a large sign for the Camino Baca Grande, just before you get to the actual town (an Information Kiosk is near this turn). Take Camino Baca Grande for about 2 miles and turn left and go up Hilltop Way for about one-third of a mile. Turn left onto Chapparal Way for about 300 yards, and where the road turns right onto East Badger Road, drive straight ahead through the large Tori Gate with the sign “Yeshe Rangsal.” The Support Building is on your left at the end of the driveway. Take Camino Baca Grande for about just over a mile and turn left up Panorama Way for about 0.6 miles. Turn right onto Peaceful Way, take your first left onto Ridgeview Way, and take your first right onto Meditation Overlook. Lama House is straight ahead. For the time being, long-term parking for the cabins will be in the parking spaces near the seasonal tent. The Retreat Caretaker will show you where this is and will be available to help carry your belongings to your cabin. At Lama House you can park in the spaces off the driveway. If you are in retreat during the winter, please bring a windshield scraper for snow and de-icing spray, and make sure your tires meet ice and snow requirements. If you need to unplug your car battery for longer stays, please see what is required for your vehicle. Should we have significant snowfall, we will have the driveway plowed. No public transportation is available in Crestone. Can I own a cabin? Pundarika Foundation, as a non-profit church, owns the land and buildings on Yeshe Rangsal Retreat Land. There is no individual ownership possible.